The rose tinted image of fruit laden boughs and confetti like blossom is rooted in centuries of traditions. Throughout ancient cultures, the apple, be it tree, fruit or blossom – is universally seen as a symbol of fertility, goodness, a protection from evil and a potent symbol of magic. 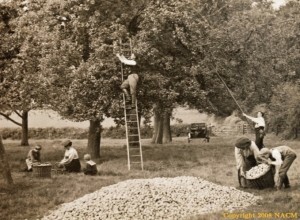 Orchard ‘wassailing’ is one legacy of the many myths and legends associated with apple trees. Wassailing is a ceremony often involving song and dance, where people drink to the health of apple trees in the hope that they will bear well. Drums, bells, whistles, and the beating of branches with sticks are used to wake the sleeping powers of fertility and to ward off evil influences. Cider is poured over the tree roots, or bread, soaked in the ‘wassailing bowl’, placed in the tree branches as an offering back to the tree. Hail to thee, old apple tree!